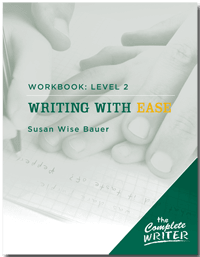 Using passages and sentences from classic children’s literature, Writing With Ease Level 2 Workbook allows young writers to practice their skills while absorbing the style and grace of great authors. All the copywork and narration materials you need for one full year of elementary writing instruction! For a great overview of what you’re trying to accomplish, check out Susan’s elementary writing lecture, A Plan for Teaching Writing: Focus on the Elementary Years. It’s our most popular audio lecture! What level should a 2nd grader purchase? Are there any examples of the books. I am trying to find what book I need to purchase. If you click on “Read Sample” (just underneath the cover photo of the book) a PDF sample will download to your computer. Any suggestions for how to teach the same level to two or more students at the same time? To do that, you’ll only need one workbook, but you should get a set of the Student Pages for the 2nd student (the student pages are a pack of all the pages from the back half of the workbook…everything the student reads or writes on). You can explain concepts or do the read-aloud sections to both students at once, and then check their work as they individually write the various sentences, etc. You might also want to search our Forums (https://forums.welltrainedmind.com/forum/3-k-8-curriculum-board/) to see how other parents are doing this.